20 to 25 percent as compared to conventional development. TOD has also proven to be the catalyst of community revitalization by stimulating economic and social activity and increasing land values. TOD is not just for new development - existing suburban neighborhoods can be modified over time to become transit-oriented, increasing property values. Programs such as the Transit Village Initiative and Urban Transit Hub Tax Credit Program are also available to assist communities who want to maximize the potential of their transit stations. 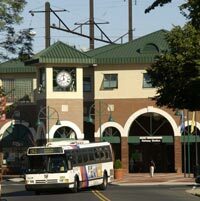 NJFIT encourages communities to take advantage of their transit stations and build compact, mixed-use neighborhoods to support both transit and pedestrian activity. TOD communities should include homes, shops, schools, civic institutions and other amenities within walking distance of transit. This encourages the creation of lively and safe transit-friendly neighborhoods. People should be able to conveniently walk or bike to surrounding shops and transit station. Providing safe streets and adequate facilities that include sidewalks, bike lanes and places to store and lock bicycles at the station is necessary. To justify frequent transit service and help create an active street life with supporting commercial businesses, TOD requires a minimum of seven residential units per acre (or 25 employees per acre in commercial centers). Parking facilities should be used to encourage more efficient use of land and more efficient travel. Parking lots can be shared between institutions with different peak demand hours (such as restaurants and offices or schools and theaters). Strategies to reduce demand for parking - charging parking fees or improving biking and walking facilities - should be explored.